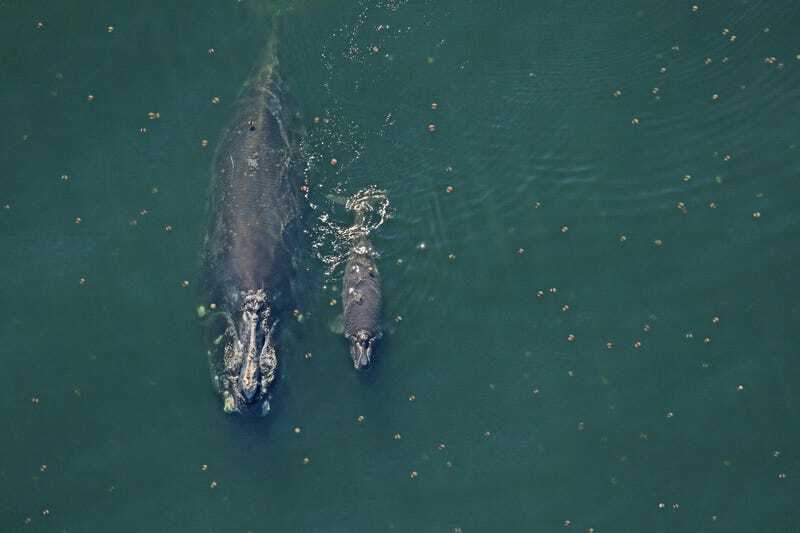 Right whale Catalog #2791 and her less than 2-week-old calf sighted off the coast of Florida January 6, 2019. Whale babies are popping off this season. Earlier this month, a critically-endangered Puget Sound orca calf was spotted in the Salish Sea. In even better news this week, the ailing North Atlantic right whale population has welcomed three new calves so far this winter. 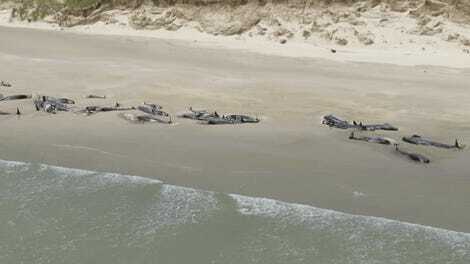 But the whales still have a long way to go before they’re out of danger. The endangered North Atlantic right whales saw no births last year, and they lost nearly 4 percent of their entire population in 2017 after 16 deaths caused by fishing gear entanglement and ship collisions. At this rate, the species’ future is looking bleak. So these three calf sightings off the coast of Florida, reported by the Florida Fish and Wildlife Conservation Commission, are a bit of bright news. The sightings took place between December 28, 2018, and January 17. Still, three newborns are not enough. If the season results in at least 12 to 15 new calves, then that’s something worth celebrating, said Charles Greene, an earth sciences professor at Cornell University who’s studied these creatures. “I’m thrilled to see that they saw three calves, but I think it’s a little bit premature to say whether we’re heading in a good direction or not,” he told Earther. Catalog #1204 and calf, the third seen so far this season, were spotted off the coast of Florida January 17, 2019. Marine ecologist Erin Meyer-Gutbrod at the University of California of Santa Barbara’s Marine Science Institute, who’s worked with Greene, would like to see breeding seasons that result in 30 or even 40 newborn calves. That would signal the “right whales are getting back on track,” she wrote to Earther in an email. After all, these calves must survive, and some of the newborns must be female to help sustain the species’ ability to breed long-term. The three new calves’ genders are still unknown. North Atlantic right whales have been in serious decline since the 19th century, when they were decimated by commercial whaling. Today, there are only 411 left of the endangered whales left on Earth. And the human threats haven’t stopped: Shipping vessel strikes and commercial fishing gear leave the animals vulnerable. So does climate change, which is warming waters and potentially threatening their food source, a small crustacean. Following last year’s dismal breeding season and 2017's unusual mortality event, people are finally stepping up efforts to protect the whales. The SAVE Right Whales Act of 2018, sponsored by Senator Cory Booker, hopes to fund conservation programs to help the species. This would involve further monitoring, research, and collaboration with industry to figure out how to reduce human impacts on the species. And on Wednesday, wind energy developers came to an agreement with environmentalists to protect whales off the coast of Martha’s Vineyard in the event that the Vineyard Wind farm comes to fruition. At the same time, the ongoing government shutdown has made it difficult for federal agencies to respond to any animals in crisis. After the mass die-off in 2017, surveyors want to keep a close eye on the animals—but as E&E News reports, the shutdown has kept surveys on pause. Right whale Catalog #2791 and calf sighted on January 7, 2019. These whales need more from us. After all, their downfall is our fault. And if we can’t protect these majestic giants, what does that say for the less glamorous animals also threatened by our decisions?